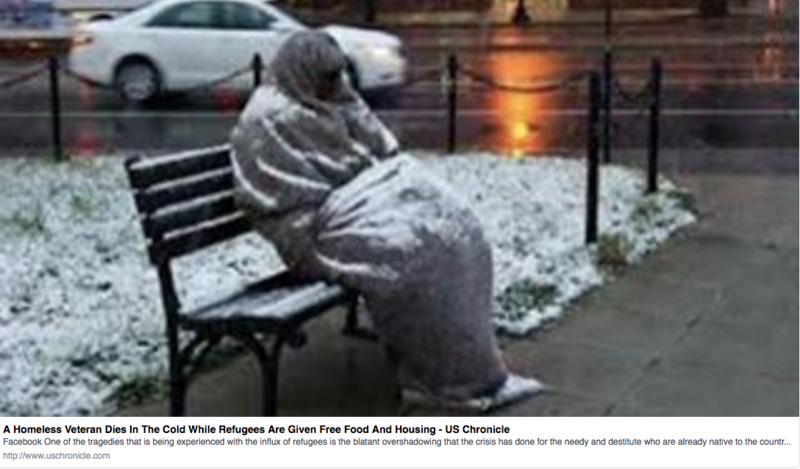 Homeless Vet Forced From Shelter, Freezes to Death-Reported as Fiction! - Truth or Fiction? Homeless Vet Forced From Shelter, Freezes to Death-Reported as Fiction! A homeless veteran was forced from a shelter and froze to death while refugees were given free food and shelter across town. This tale of a homeless veteran freezing to death after being forced from a shelter started out as a hypothetical warning about the dangers of a broken immigration system, and it was later misidentified as an actual news story about a homeless vet freezing to death. To be clear, veteran homelessness is a nationwide issue that affects tens of thousands of veterans. The Department of Veterans Affairs (VA) runs various programs that have successfully reduced veteran homeless by 70 percent since 2005, but it’s an undeniable fact that not all veterans who need help get help. But this specific rumor about a homeless veteran freezing to death while refugees across town received food and shelter appears to be false. This took place in Sweden, but could have just as easily happened here in the US. Refugees are being given housing, entitlements and jobs, while citizens are losing their livelihoods and are being kicked out on the street in the name of diversity. Among the saddest of these cases are the homeless that die while refugees are set up in comfort. In January, a homeless Swedish vet froze to death on the streets while a Muslim African family was given free housing and taught how to use a toilet for the first time. I kid you not. Just beyond deplorable. Liberals have created a situation that would have been unthinkable just a few years ago. Refugees who are flooding into host nations at an unprecedented rate are demanding housing, food and free education all while increasing the crime rate and refusing to follow the laws. If this isn’t bad enough homeless veterans who have sacrificed their lives and mental health are cast out onto the streets. Where are their advocates? Liberals don’t seem too concerned with the military and the men and women who serve them and have shown utter contempt towards them time and again. The USHerald.com account was shared nearly 400,000 times, giving rise to the widespread misconception that a homeless vet had actually been forced from a homeless shelter and froze to death while refugees received free food and shelter across town. 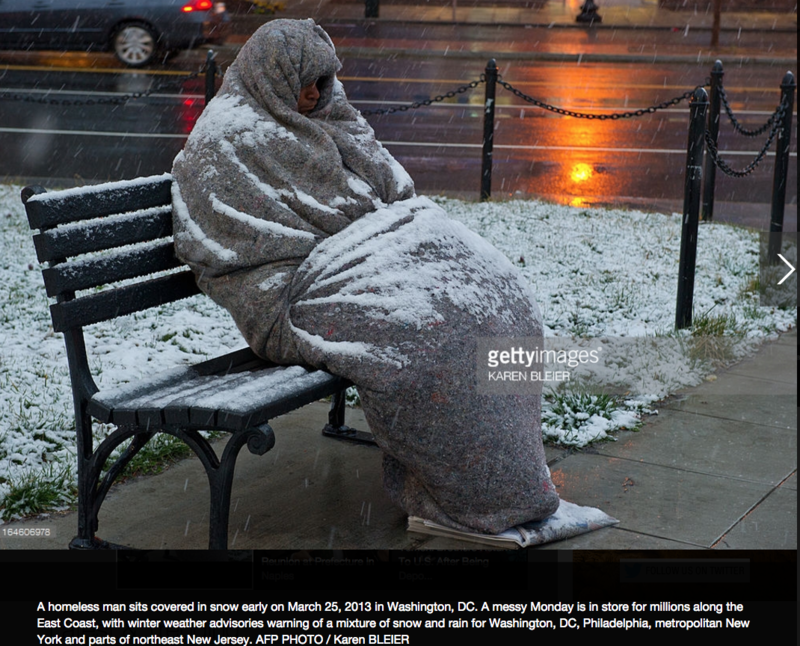 A man bundled on a bench in this 2013 Getty Images photo has bene misidentified as a homeless vet who froze to death after being forced from a shelter. So, as is often the case, this photo accompanying reports about a homeless veteran who froze to death after being forced from a shelter can be used to help debunk it. And we searched high and low for reports about a homeless veteran freezing to death after being forced from a homeless shelter, but we couldn’t find any in the U.S. The closest we came was a March 2015 report about a veteran who froze to death in an Iowa woods shortly after visiting a VA hospital. However, key details don’t match up. The vet wasn’t homeless, he wasn’t forced from a homeless shelter and his death was unrelated to the resettlement of refugees. Rumors that a homeless vet was forced from a shelter and froze to death have been circulating since early 2015. New Guinea Flatworm Invading Florida, United States-Truth! & Unproven!